Streamline Construction Inc. is a orange county general contractor that knows kitchens are the heart of any home and can set the tone and flow of the rest of the house. Choosing the right materials and style can be difficult as there are many components and options that are involved when Remodeling your kitchen in orange county. Whether it's selecting the right counter-top or back-splash, picking the perfect range hood and other appliances, the knobs on the cabinetry, or redesigning the layout for your kitchen, Streamline Construction's design and build team can guide you to make the right choices in creating your dream kitchen. As a general contractor in Orange County since the early 90's, we have been constructing quality custom cabinets and countertops for over 20 years. All of our cabinets and countertops are installed using our own trained and experienced cabinet installers. Separate your home from the ordinary with Streamline Construction Inc. We specialize in kitchen Remodeling and bathroom cabinets, entertainment centers, book cases, and office cabinets in orange county. Why work hard on designing your kitchen, when you can let our designers work for you? At Streamline Construction Services Orange County, we offer high quality interior painting services to create the perfect ambience for your kitchen. We have a wide array of colors to choose from to make it completely custom to your taste. Our expert painting professionals are careful to cover any exposed areas and protect your home from paint and other debris, and gladly cleans up after, leaving your walls looking beautiful and brand-new. Read more about our painting services in Orange County. If interior design is not your strong suite, not to worry! Our expert team has over 20 years of experience in the remodeling industry and we pride ourselves on our skill to pick out the perfect materials and create a special feel for the heart of your home that you'll love for years to come. Whether you want a modern, streamline design, a romantic, tuscan-inspired look, or a farmhouse friendly kitchen, our designers are excited to bring your vision to like that fits your own unique style. 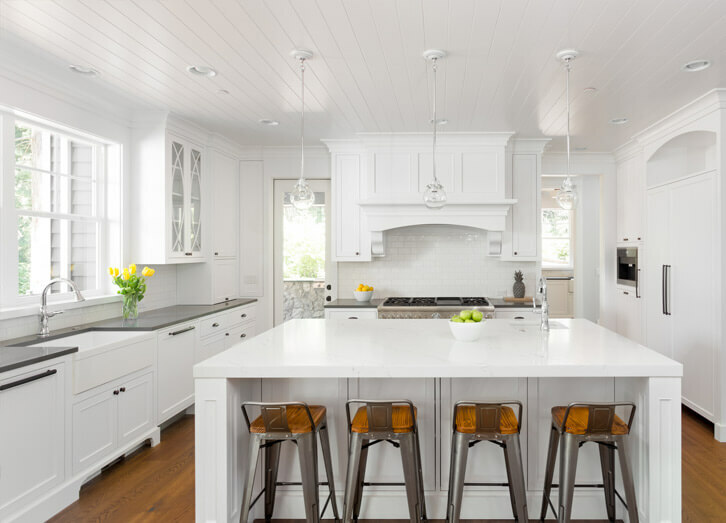 Whether you're in the market to redesign your kitchen today or you're still shopping around for the best possible price and value, check out some of our favorite kitchen design ideas to give you some inspiration and help you dream up your perfect kitchen. Streamline Construction Services was rated Best of Houzz 2016 with over 31 five star reviews!